COLORADOSPRINGS, Colo. - An Atlas booster is poised to hurl from Florida the reusableX-37B Orbital Test Vehicle into space ? now projected to be an April 21 launch. The X-37Borbital space plane, essentially a mini-shuttle, will be placed into Earth orbitand loiter in space for an unspecified period of time. It will then reenter foran auto-pilot landing at Vandenberg Air Force Base in California, or atneighboring Edwards Air Force Base as back-up. It's atight-lipped affair, with its builder ? Boeing Phantom Works ? pledged toretain vocal silence on the flight ? advising this reporter here that they"defer to the customer" ? the Air Force Rapid Capabilities Office. The X-37BOrbital Test Vehicle (OTV) is capable of supporting a flexible range of experiments,Blair said. "The first mission will emphasize proving technologiesnecessary for long duration reusable space vehicles with autonomous reentry andlanding capabilities." "It's adevelopmental effort," Blair said, and it's standard practice with manyDepartment of Defense development efforts, "specific details of the OTVcapabilities, limitations and vulnerabilities" are classified. Oncelaunched, the X-37B isdesigned for space missions of up to 270 days, Blair advised, if everythinggoes as planned. The space plane was designed for low earth orbits, rangingfrom 110 to 500 nautical miles, she told SPACE.com. All thatbeing said, exactly where the vehicle's mission control center is locatedremains classified. The longterm assignment of a mission control center is dependent upon a successfulcapabilities demonstration, followed by transition to an operational command,Blair explained. "But what we can say is that the X-37B will be operatedby contractors under the direction of Air Force Space Command's 3rd SpaceExperimentation Squadron." According toa U.S. Air Force website, the 3rd Space Experimentation Squadron is the AirForce Space Command's (AFSPC) premier organization for space-baseddemonstrations, pathfinders and experiments. The unit identifies concepts ofemployment, training, education and technical skill sets required to fieldselected future AFSPC missions. Thissquadron is developing a core cadre of space professionals to serve as subjectmatter experts for all future AFSPC space-based endeavors, demonstrateoperational utility of selected demonstrations and apply lessons learned fromdemonstrations and pathfinders for use in future initiatives. As forprogram cost, Blair said that the X-37B effort leverages extensive and earlyAir force, NASA, and Boeing investments. "Details on the funding levelremain within the Air Force's classified budget request," she said. Whilethere's a high-level of hush-hushness surrounding theflight, what could the X-37B flight imply and what's behind the project? There couldbe a trio of rationales, suggested military space specialist, Roger Handberg, Professor and Chair in the Department ofPolitical Science at the University of Central Florida in Orlando. The X-37Bappears to be a vestige of the 1990s push by the Air Force and NASA forreusable vehicles, Handberg noted. He advised thatthe project may signify continued U.S. Air Force interest in a rapid responsevehicle along the lines of the long-proposed space maneuver vehicle and theX-37B is their best shot for that type program. "Thesecond explanation is that of bureaucratic inertia in military programs whichis why the justifications and cost estimates are so obscure andmysterious," Handberg said. "Once started,programs are difficult to kill especially when the proponents speak ofmarvelous capabilities analogous to aircraft style operation down theroad." A thirdreason, Handberg continued, is to think of thiseffort "as the logical extension of the push into unmanned aerial vehicles(UAVs) where vehicles used for observation have movedinto weapon carriers and various of other missions, many classified. "Indeed, one could build an architecture linking UAVs and such vehicles to giveyou truly global reach, he added. In theglobal scheme of things, how might other nations perceive the X-37B flight? "Fromthe perspective of international observers ? especially in space-aspiringstates such as China, the X-37B program just reinforces their view that theU.S. is pushing to gain first mover advantage in rapid response includingpossible weaponization of space using this vehicle ora derivative," Handberg responded. Possessionof such a capability, Handberg said, would allow theU.S. to, in a sense, threaten other states by our possession of a rapidresponse capabilities that can ? through payload swap out ? go from peacefulreconnaissance to direct attack on other states' spacecraft. Despite allthe secrecy and strangeness of the mission, the X-37B flight showcasestechnologies that may well spill over into the commercial world. "We dosee the launch as good progress in the area of lifting bodies and one whichwill help demonstrate many of the things that we have been saying foryears," said Mark Sirangelo, Sierra NevadaCorporation's (SNC) Corporate Vice President in charge of SNC's Space SystemsGroup. SNC isworking on development of the wingedDream Chaser, a competitor in NASA's Commercial Crew Development (CCDev) initiative. Sirangelo explained: "Webelieve that there is a place for lifting body runway landing spacecraft in thecommercial and government fleet to accomplish not only International SpaceStation crew and cargo transport but also to conduct other viable missions, forsatellite deployment and other near space operations." SNC's DreamChaser plans call for it to also launch on an Atlas booster. United Launch Allianceis on their CCDev team. 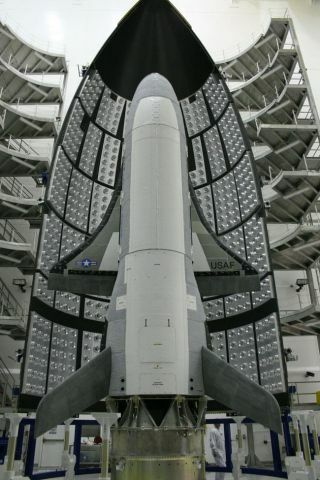 "Weexpect that this [X-37B] launch experience will also help our knowledge of theAtlas's performance relative to lifting body vehicles," Sirangelo told SPACE.com. "The X-37 seems to befocused on military needs and is an unmanned demonstration while we arefocusing primarily on a crewed civil and commercial mission profile," hesaid.